We all know the situation, you want to look put together but with minimal effort. Yes, that is often me! Don't get me wrong, obviously I love make up and I always enjoy applying it but sometimes I just need it to be snappy. That extra time snoozing is needed people! So I've had a search through my stash and picked out the eyeshadows I turn to on those days. Basically I have the same method for applying all of these shades, its very technical I'll have you know.... I apply the colour all over my eyelid then take a clean, fluffy brush and blend, blend, blend. 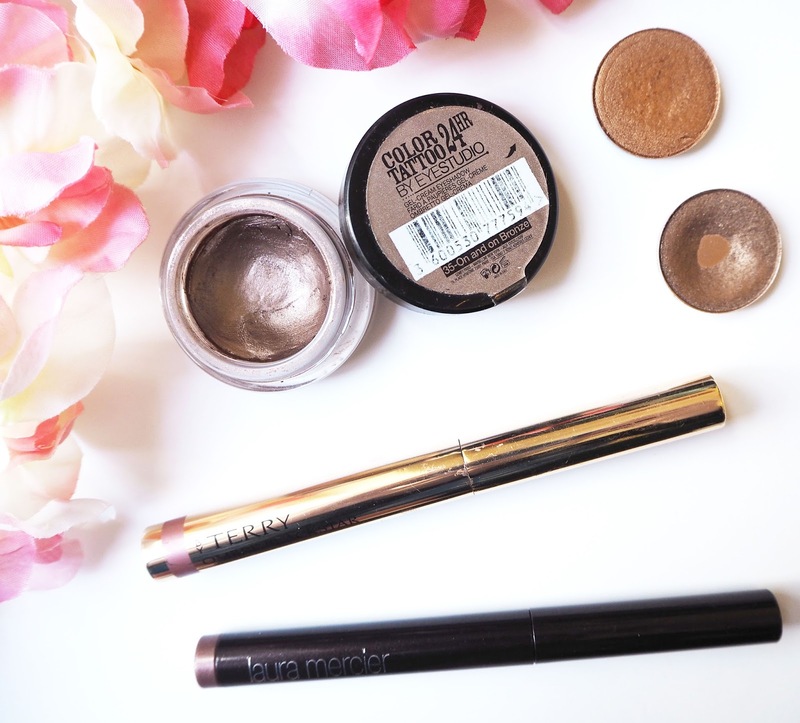 Cream eyeshadows in stick form are also an absolute saviour for easy eye looks. I've picked out two that I love, the first one is the By Terry Ombre Blackstar in Misty Rock. Now this is a little pricey at £29 but I have no regrets whatsoever about buying this beauty. It's quite an unusual shade in that its a mesh between a bronze and a purple but its just sooo flattering against many eye colours. The formula of this is bloody amazing, it doesn't budge or crease at all, so it'll take two secs to apply and will then stay put throughout the day. Thats got to tick all the boxes surely? Another one I love is the Laura Mercier Caviar Stick Eye Colour in Amethyst. Now I have to confess only when I swatched these two next to each other did I realise how similar they were, oops. And yes its definitely another 'brown with a bit of purple thrown in' colour. I do find this one looks darker on the eye though and is less shimmery than the By Terry version once blended out. It's a little cheaper at £23 but it does need a tad more work with the blending to get it looking seamless. Two Mac eyeshadows that I have come to depend on for my 'can't be bothered days' are Amber Lights and Woodwinked. I've developed an obsession with Amber Lights lately as its just the perfect shimmery, amber shade. It's got so much pigment in too that it just always looks so bright and vibrant, with this your eyes will definitely be the focus point of your look. Woodwinked is a long time fave of mine and one that I always go back to. It's a gorgeous warm toned brown shade that you can wear sheer or really build up for a more striking look, I just heart it so much. Of course let me know which eyeshadows you turn to for a quick look!